Midrash to Numbers and Deuteronomy (for the title "Sifre debe Rab" see R. Hananeel on Sheb. 37b, Alfasi on Pes. x., and Rashi on Hos. ii. 1; it occurs likewise in Mak. 9b, where, as Berliner says in his edition of Rashi, p. 372, is an error for ; comp. "'Aruk," s.v. ). In regard to the reference in Sanh. 86a concerning the Sifre of R. Simeon see Mekilta de-Rabbi Shim'on; the question has likewise been raised whether, in view of the well-known close relation that existed between the school of R. Simeon and that of R. Ishmael (Yoma 59a; Zeb. 53b, 119b; Ḥul. 69b), the words apply to R. Simeon's Sifre in the same degree as to the other works mentioned in this Talmudic passage (Levy, "Ueber Einige Fragmente aus der Mischnah des Abba Saul," p. 11, note 15). Such questions, however, are unimportant in reference to the Sifre now extant; for this work is certainly not identical with the Talmudic Sifre; and, on closer investigation, it is found to be not a uniform work, but one composed of parts which did not originally belong together. Frankel in his "Darke ha-Mishnah" (p. 319) drew attention to the difference between that portion of the Sifre which refers to Numbers and that which refers to Deuteronomy, though, curiously enough, he misunderstood this difference and consequently arrived at false conclusions. Hoffmann has correctly defined the relation between the two in his "Zur Einleitung in die Halachischen Midraschim." pp. 52 et seq. 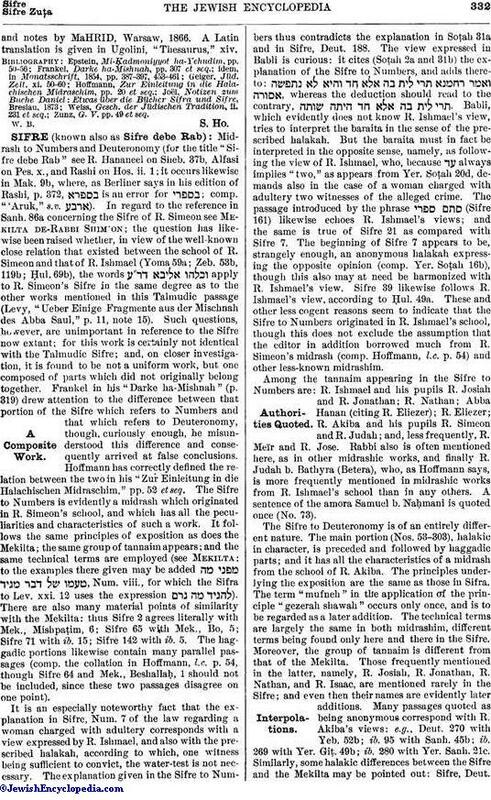 The Sifre to Numbers is evidently a midrash which originated in R. Simeon's school, and which has all the peculiarities and characteristics of such a work. It follows the same principles of exposition as does the Mekilta; the same group of tannaim appears; and the same technical terms are employed (see Mekilta; to the examples there given may be added , Num. viii., for which the Sifra to Lev. xxi. 12 uses the expression ). There are also many material points of similarity with the Mekilta: thus Sifre 2 agrees literally with Mek., Mishpaṭim, 6; Sifre 65 with Mek., Bo, 5; Sifre 71 with ib. 15; Sifre 142 with ib. 5. The haggadic portions likewise contain many parallel passages (comp. the collation in Hoffmann, l.c. p. 54, though Sifre 64 and Mek., Beshallaḥ, 1 should not be included, since these two passages disagree on one point). It is an especially noteworthy fact that the explanation in Sifre, Num. 7 of the law regarding a woman charged with adultery corresponds with a view expressed by R. Ishmael, and also with the prescribed halakah, according to which, one witness being sufficient to convict, the water-test is not necessary. The explanation given in the Sifre to Numbers thus contradicts the explanation in Soṭah 31a and in Sifre, Deut. 188. The view expressed in Babli is curious: it cites (Soṭah 2a and 31b) the explanation of the Sifre to Numbers, and adds thereto: , whereas the deduction should read to the contrary, . Babli, which evidently does not know R. Ishmael's view, tries to interpret the baraita in the sense of the prescribed halakah. But the baraita must in fact be interpreted in the opposite sense, namely, as following the view of R. Ishmael, who, because always implies "two," as appears from Yer. Soṭah 20d, demands also in the case of a woman charged with adultery two witnesses of the alleged crime. The passage introduced by the phrase (Sifre 161) likewise echoes R. Ishmael's views; and the same is true of Sifre 21 as compared with Sifre 7. The beginning of Sifre 7 appears to be, strangely enough, an anonymous halakah expressing the opposite opinion (comp. Yer. Soṭah 16b), though this also may at need be harmonized with R. Ishmael's view. Sifre 39 likewise follows R. Ishmael's view, according to Ḥul. 49a. These and other less cogent reasons seem to indicate that the Sifre to Numbers originated in R. Ishmael's school, though this does not exclude the assumption that the editor in addition borrowed much from R. Simeon's midrash (comp. Hoffmann, l.c. p. 54) and other less-known midrashim. Among the tannaim appearing in the Sifre to Numbers are: R. Ishmael and his pupils R. Josiah and R. Jonathan; R. Nathan; Abba Hanan (citing R. Eliezer); R. Eliezer; R. Akiba and his pupils R. Simeon and R. Judah; and, less frequently, R. Meïr and R. Jose. Rabbi also is often mentioned here, as in other midrashic works, and finally R. Judah b. Bathyra (Betera), who, as Hoffmann says, is more frequently mentioned in midrashic works from R. Ishmael's school than in any others. A sentence of the amora Samuel b. Naḥmani is quoted once (No. 73). The Sifre to Deuteronomy is of an entirely different nature. The main portion (Nos. 53-303), halakic in character, is preceded and followed by haggadic parts; and it has all the characteristics of a midrash from the school of R. Akiba. The principles underlying the exposition are the same as those in Sifra. The term "mufneh" in the application of the principle "gezerah shawah" occurs only once, and is to be regarded as a later addition. The technical terms are largely the same in both midrashim, different terms being found only here and there in the Sifre. Moreover, the group of tannaim is different from that of the Mekilta. Those frequently mentioned in the latter, namely, R. Josiah, R. Jonathan, R. Nathan, and R. Isaac, are mentioned rarely in the Sifre; and even then their names are evidently later additions. Many passages quoted as being anonymous correspond with R. Akiba's views: e.g., Deut. 270 with Yeb. 52b; ib. 95 with Sanh. 45b; ib. 269 with Yer. Giṭ. 49b; ib. 280 with Yer. Sanh. 21c. Similarly, some halakic differences between the Sifre and the Mekilta may be pointed out: Sifre, Deut.123 differs from Mek., Mishpaṭim, 1; ib. 122 from Mek., Mishpaṭim, 2, which latter reproduces R. Ishmael's view (comp. Hoffmann, l.c. pp. 68, 69). All these points indicate that the Sifre to Deuteronomy originated in R. Akiba's school; and, as several anonymous passages may be cited to express the views of R. Simeon, this midrash may with a fair degree of certainty be ascribed to him. Such anonymous passages are found in Sifre 72-74, several sections of which Mak. 17a identifies as R. Simeon's interpretations. The same appears to be the case in Sifre 94, compared with Sanh. 112a; ib. 103 with Ḳid. 57a; ib. 121 with Sanh. 46b. Sifre 166, and perhaps also 165, likewise correspond with R. Simeon's views (comp. Ḥul. 136b; Tosef., Ḥul. ix. 2, x. 1); while in Sifre 303 the explanation of , and the omission of , also imply an agreement therewith (comp. Yeb. 73b and Bik. ii. 2). There are, however, some exceptions to the rule; e.g., Sifre 110 compared with ib. 281 and B. M. 115a; ib. 219 with Sanh. 45b (the last-cited passage, however, may also be so interpreted as to harmonize with R. Simeon's opinion). Sifre 230 likewise contradicts R. Simeon's view, according to Kil. vii. 7. But, since it has not been claimed that the Sifre to Deuteronomy represents R. Simeon's midrash in its original form, these few exceptions prove nothing. 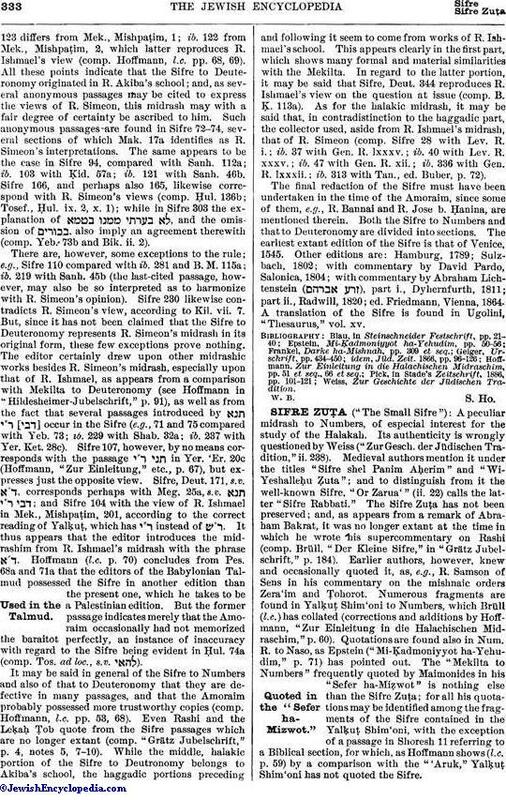 The editor certainly drew upon other midrashic works besides R. Simeon's midrash, especially upon that of R. Ishmael, as appears from a comparison with Mekilta to Deuteronomy (see Hoffmann in "Hildesheimer-Jubelschrift," p. 91), as well as from the fact that several passages introduced by ] occur in the Sifre (e.g., 71 and 75 compared with Yeb. 73; ib. 229 with Shab. 32a; ib. 237 with Yer. Ket. 28c). Sifre 107, however, by no means corresponds with the passage in Yer. 'Er. 20c (Hoffmann, "Zur Einleitung," etc., p. 67), but expresses just the opposite view. Sifre, Deut. 171, s.v. , corresponds perhaps with Meg. 25a, s.v. ; and Sifre 104 with the view of R. Ishmael in Mek., Mishpaṭim, 201, according to the correct reading of Yalḳuṭ, which has instead of . It thus appears that the editor introduces the midrashim from R. Ishmael's midrash with the phrase . Hoffmann (l.c. p. 70) concludes from Pes. 68a and 71a that the editors of the Babylonian Talmud possessed the Sifre in another edition than the present one, which he takes to be a Palestinian edition. But the former passage indicates merely that the Amoraim occasionally had not memorized the baraitot perfectly, an instance of inaccuracy with regard to the Sifre being evident in Ḥul. 74a (comp. Tos. ad loc., s.v. ). It may be said in general of the Sifre to Numbers and also of that to Deuteronomy that they are defective in many passages, and that the Amoraim probably possessed more trustworthy copies (comp. Hoffmann, l.c. pp. 53, 68). Even Rashi and the Leḳaḥ. Ṭob quote from the Sifre passages which are no longer extant (comp. "Grätz Jubelschrift," p. 4, notes 5, 7-10). While the middle, halakic portion of the Sifre to Deutronomy belongs to Akiba's school, the haggadic portions preceding and following it seem to come from works of R. Ishmael's school. This appears clearly in the first part, which shows many formal and material similarities with the Mekilta. In regard to the latter portion, it may be said that Sifre, Deut. 344 reproduces R. Ishmael's view on the question at issue (comp. B. Ḳ. 113a). As for the halakic midrash, it may be said that, in contradistinction to the haggadic part, the collector used, aside from R. Ishmael's midrash, that of R. Simeon (comp. Sifre 28 with Lev. R. i.; ib. 37 with Gen. R. lxxxv. ; ib. 40 with Lev. R. xxxv. ; ib. 47 with Gen. R. xii. ; ib. 336 with Gen. R. lxxxii. ; ib. 313 with Tan., ed. Buber, p. 72). The final redaction of the Sifre must have been undertaken in the time of the Amoraim, since some of them, e.g., R. Bannai and R. Jose b. Ḥanina, are mentioned therein. Both the Sifre to Numbers and that to Deuteronomy are divided into sections. The earliest extant edition of the Sifre is that of Venice, 1545. Other editions are: Hamburg, 1789; Sulzbach, 1802; with commentary by David Pardo, Salonica, 1804; with commentary by Abraham Lichtenstein ( ), part i., Dyhernfurth, 1811; part ii., Radwill, 1820; ed. Friedmann, Vienna, 1864. A translation of the Sifre is found in Ugolini, "Thesaurus," vol. xv. Weiss, Zur Geschichte der Jüdischen Tradition.